We are an Australian/American husband and wife design team. Nicholas' formal training is from the University of Sydney in Architecture. Mine is from Miami University in Ohio in Oil Painting and Fashion Institute of Technology, NYC in Fashion Design. We live for traveling and exploring the local cuisine and architecture. We are just finishing up 3 months of travel to Tokyo, Morocco, London, Barcelona, Chicago, Miami, NYC and LA. We are always planning our next adventure in search of inspiration. We were inspired to design a collection of chic home storage pieces that we would use in our own home. We wanted to create a collection of fashionable vessels that were luxury pieces for the home, office or nursery. Australians tend to have 2-10 baskets in one home. We felt this item was greatly overlooked and we wanted to make luxury and modern pieces that were still sustainable and natural. We always wanted to make J'Jute as clean as possible. Our pieces will be in people's homes; around loved ones, kids, our kids. We want people to feel safe knowing our pieces are clean and natural as possible. We felt it was our responsibility to be conscious. Each basket ships out flat packed in our specially designed recyclable J'Jute polypropylene bags. 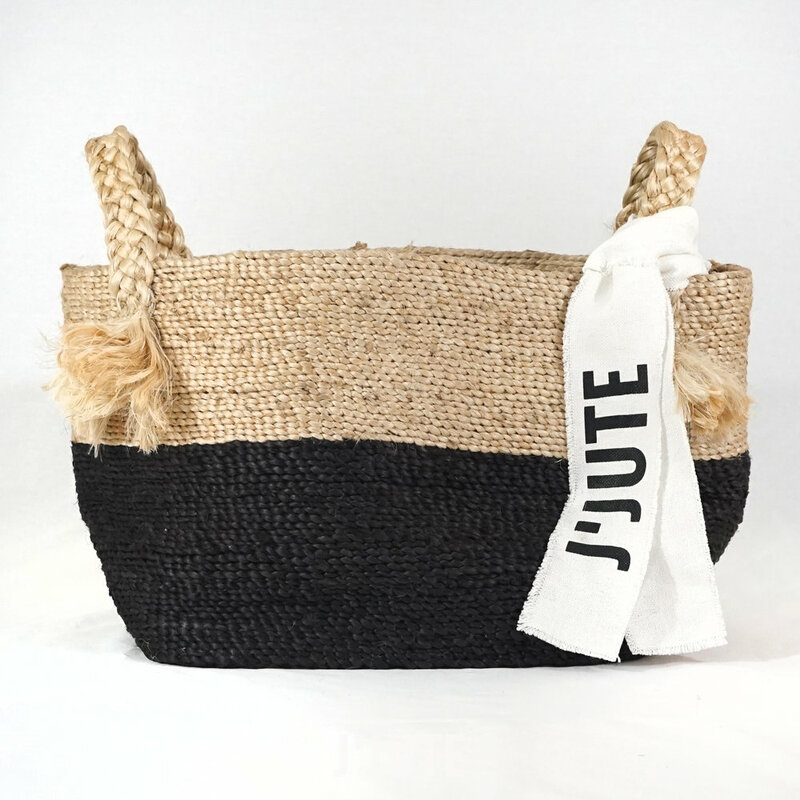 Nic and I came up with J'Jute in 2015 when we were looking to add storage items to our other brand, Dunlin. Dunlin is a homewares brand that focuses on essential classics. We were tired of everything out there. We wanted to create chic storage that was fashionable. We knew we were only going to find what we were looking for by creating it ourselves. J'Jute centers on one collection a year. We aren't pumping out 100 styles at a time. Our pieces are unique quality items we want people to collect and add to over time. We are a thoughtful design team concentrating on organizing you in style and creating edited collections. Our pieces are handcrafted to last using durable naturally dyed products. Sustainability will always be the core of J'Jute but, we will never sacrifice style. This is what makes J'Jute, J'Jute. Our favourite item is the Malay Small Tassel basket in Tideline. The Malay embodies all elements of the Beach Collection Natural Jute, Onyx Naturally dyed Jute and fringe handle details that you also see throughout the collection.